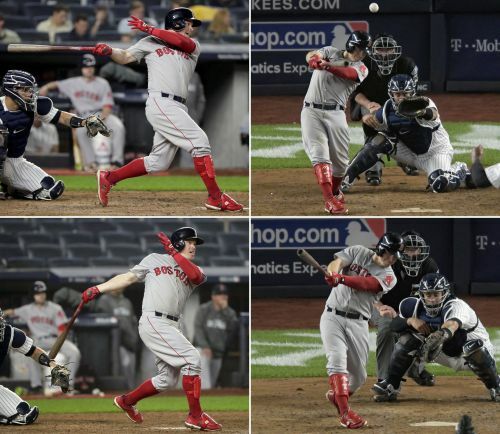 NEW YORK (AP) — Brock Holt had one thing in mind: He was swinging for the fences. "You get a little antsy when a position player is on the mound. I told everyone, 'Get me up. I need a home run for a cycle,'" Holt said. "I scooted up in the box a little bit, and I was going to be swinging at anything and try to hook anything. Obviously, you don't expect to hit a home run, but I was trying to. I was trying to hit a home run. That's probably the first time I've ever tried to do that. I rounded the bases, and seeing everyone going nuts in the dugout was a pretty cool moment for me." Red Sox: Porcello (17-7, 4.28 ERA) got two late outs in relief during the series opener last Friday, so his start was pushed back a day to Game 4. The 2016 AL Cy Young Award winner, who grew up a Mets fan in nearby New Jersey, was 2-0 with a 2.31 ERA in three starts against the Yankees this year — including a one-hitter on just 86 pitches Aug. 3 at Fenway Park. He is 0-3 with a 5.33 ERA in 12 career postseason outings, including four starts. Yankees: The 38-year-old Sabathia (9-7, 3.65) will be on 11 days' rest when he makes his 23rd postseason start. The big lefty was ejected from his last regular-season outing for hitting Tampa Bay catcher Jesus Sucre with a pitch during a testy game between division rivals on Sept. 27. Sabathia appealed a five-game suspension from Major League Baseball that would not take effect until next season. He said Monday he definitely wants to play in 2019 — even if it's not for the Yankees.